Your own mini ranch in sought after Blue Creek! 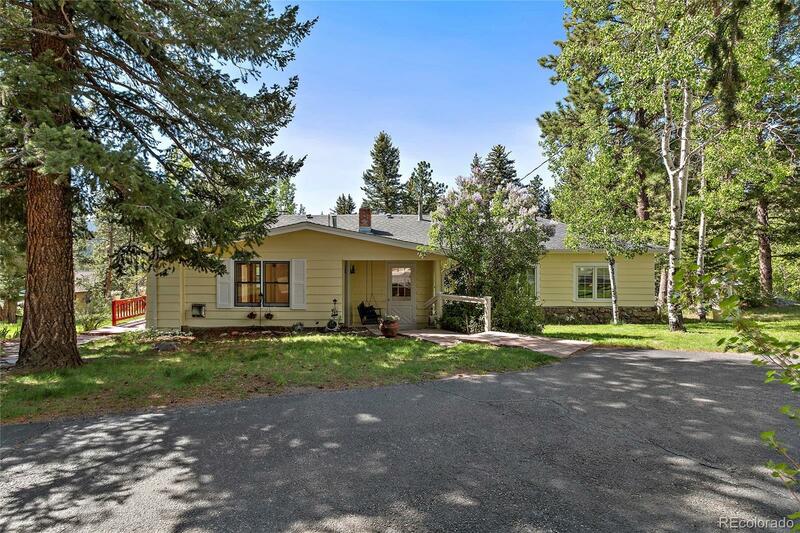 This adorable home sits on 3 beautiful, gentle lush acres. Great horse property. Just a short ride to Flying J Ranch Open Space park. Enjoy the one level living this home has to offer. Big living room with a lovely rock fireplace with wood ceilings and beams. There is also a separate family room with a gas stove and log accent. Hardwood floors throughout. The large master suite has a huge walk-in closet and recently remodeled bathroom. The kitchen has plenty of room to include a dining area with a lovely bay window. You will love the additional historic cabin. The cabin does not have water or sewer, however, does have power. Ideal for a studio, workshop, quests for the summer, etc. two nice decks for enjoying the gorgeous Colorado days. The 2-car oversized garage would easily accommodate a workshop. Another additional building is ideal for hay, tack, bicycles, etc. Easy access and just a few minutes to your local shopping areas.